are of high carbon steel. 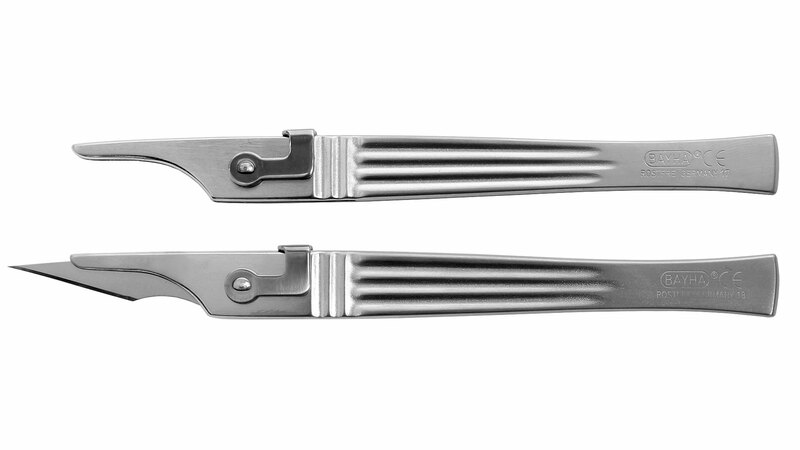 These knives are beveled on both sides (not one side like a marking knife) and are sold as blades only, no handles. Recommended by master violin makers! 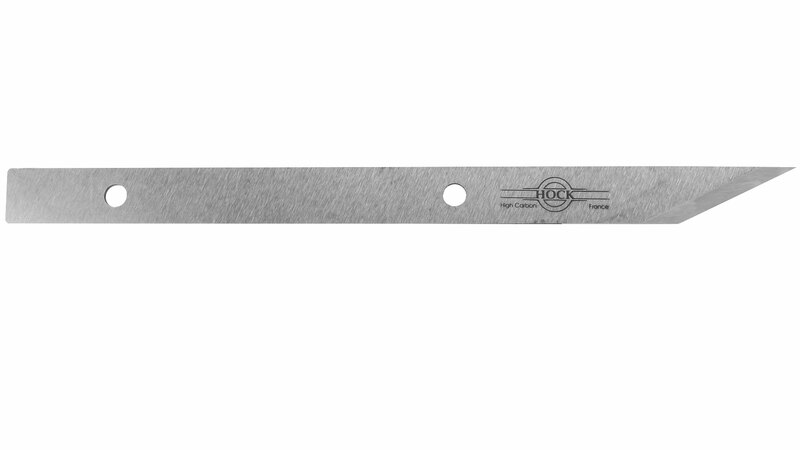 In opposite to most other chip carving knifes with rounded tip these Hock knives come with a sharp tip. About the quality click at our plane blades page. Not only surgeons but also craftsmen and craftswomen find the scalpel made by BAYHA in Germany to be a fine tool for many exact tasks. 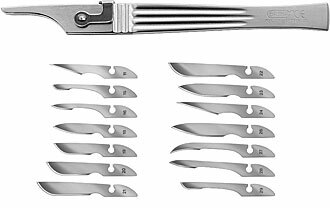 The scalpel can be used for making notches, cutting cardboard, or creating delicate inlays. The blades offered here are exclusively for technical use and NOT sterile! The handle is stainless but the blades are not - being of carbon steel, they can rust . Carbon steel permits of considerably greater sharpness than do stainless steel alloys. These blades are easy to sharpen, but you can decide for yourself whether this is worth your while at this price. The blades are easy to exchange. Move the handle upwards, and the blade is free. Insert the blade following the direction of the arrow and close the handle. The blade is now positioned firmly and reliably. This handle is made of stainless steel. 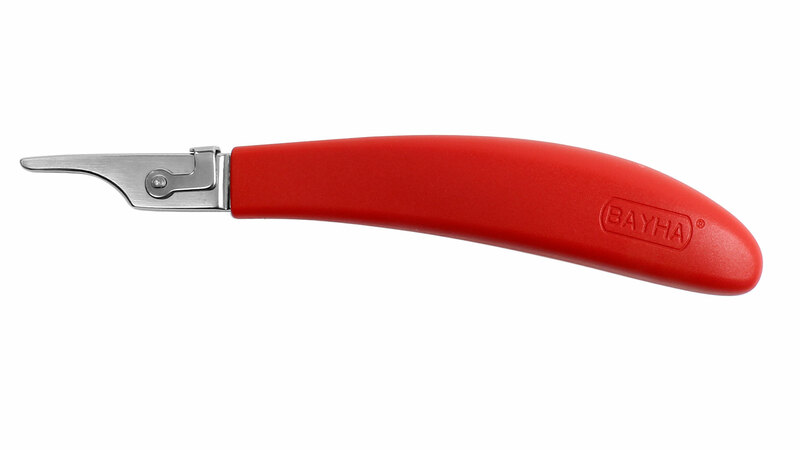 The new ergonomic handle makes working with scalpel blades less fatiguing. 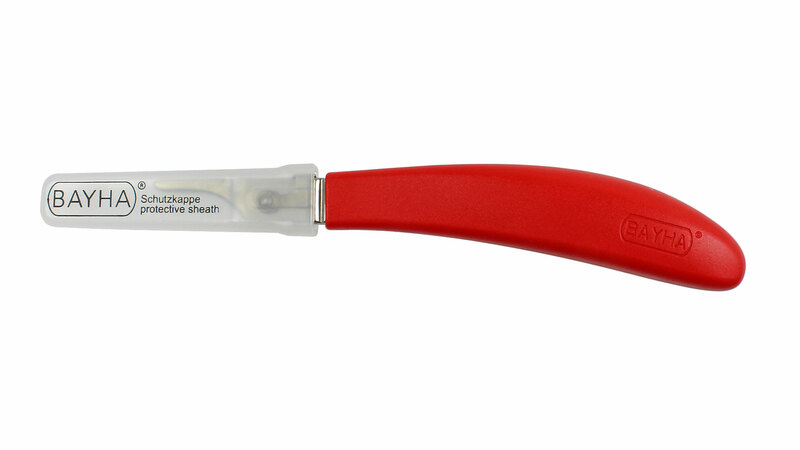 As with the other scalpel handle shown abovet the blades are easy to exchange. Move the handle upwards, and the blade is free. Insert the blade following the direction of the arrow and close the handle. The blade is now positioned firmly and reliably. The metal parts of this handle are made of stainless steel. 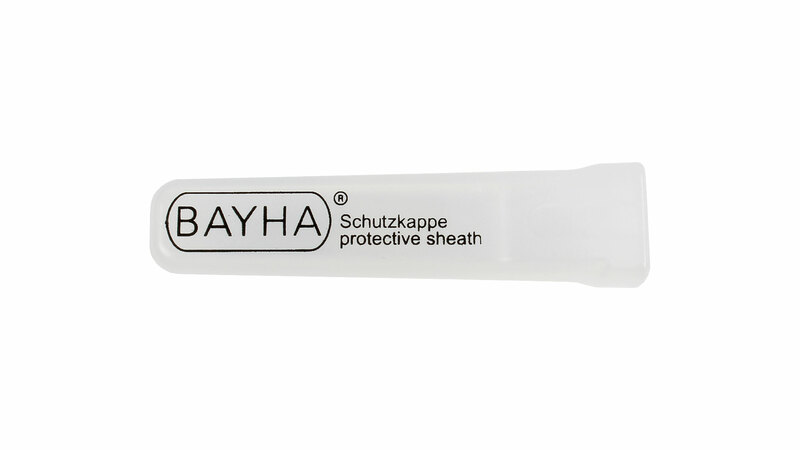 This protective sheath protects both blades and your hand when the scalpel is not in use. Fits all Bayha handles and all Bayha blades shown on this page. Picture left bottom: protective sheath covering the blade. Note: Blade and handle not included! 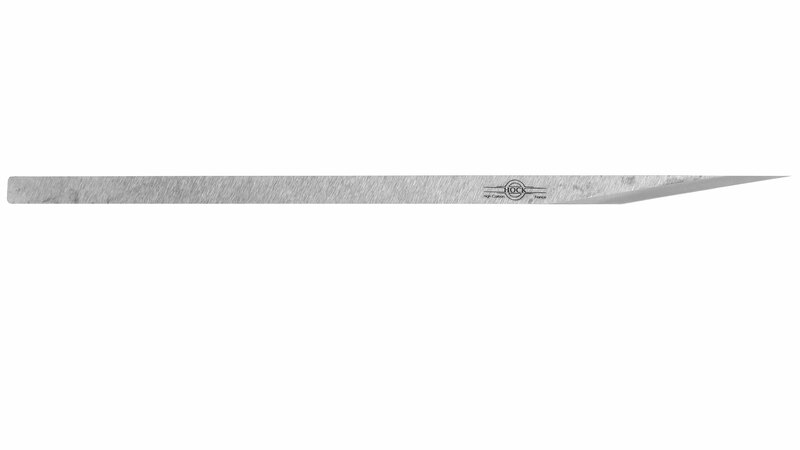 Note: all Bayha blades we offer are made of Carbon steel and therefore not rust free! 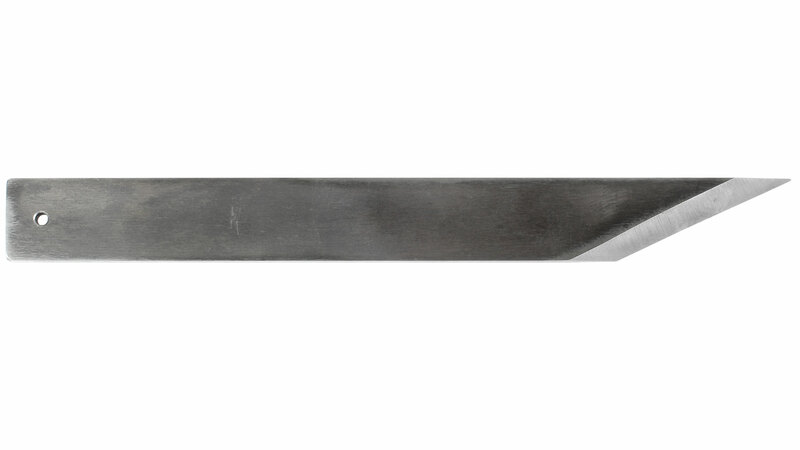 The advantage of carbon steel is that you can achieve a high sharpness and they can be resharpened easily. We sell these blades for detail wood carving, not for medical use! You do not know which blades you want to use in the future? 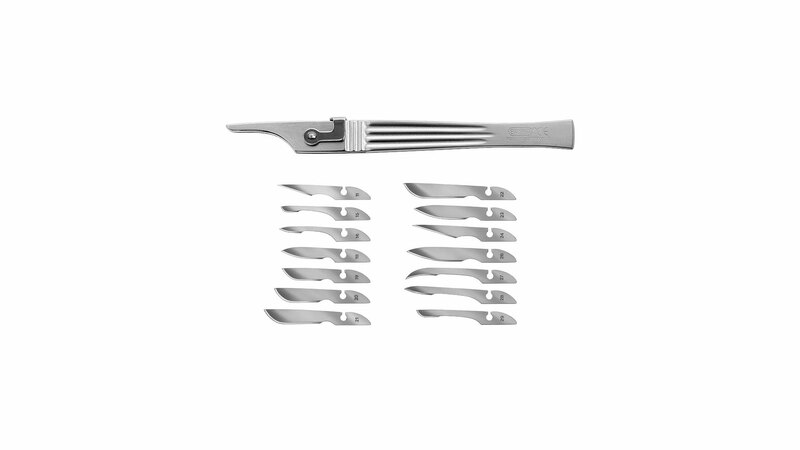 No problem, order our Basic Set, contents one scalpel handle no. 307201 and 14 blades (not sterile) - one of each type.